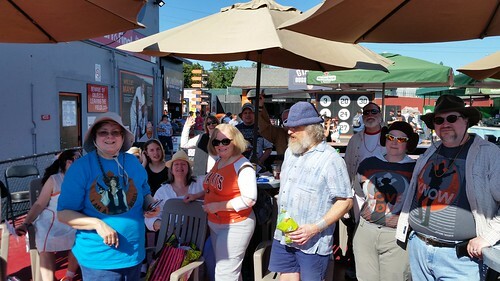 I did attend Star Wars Day at the San Jose Giants (California league A level affiliate of the San Francisco Giants) on Saturday, where Ken Patterson had organized a BASFA day at the ballpark. Here's what it looked like from the Martinelli's VIP Box. 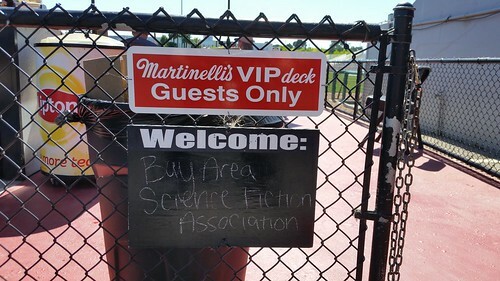 A section of the VIP Box was set aside for BASFA members. Our admission included excellent food from "Tatooine Mike's" (as the BBQ was rebranded for today only) and two free drinks. But with the heat (you may have noticed game time temps of 34°C) we needed more. Also, the BASFAns migrated around our box seeking shade, so we couldn't take full advantage of our space. Here was the ceremonial first pitch. Star Wars characters were all around the park. 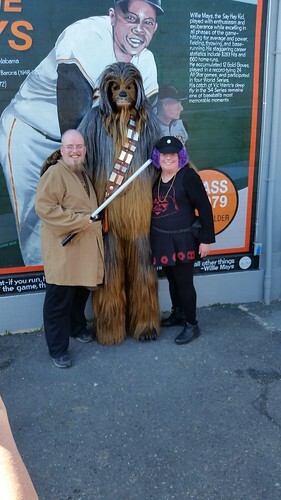 Costumes were encouraged, and we got a visit from Chewbacca. As the sun mercifully dipped behind the trees, we also got a visit from the "little Giants" big mascot, Gigante. Click through any of the photos to see more of them. 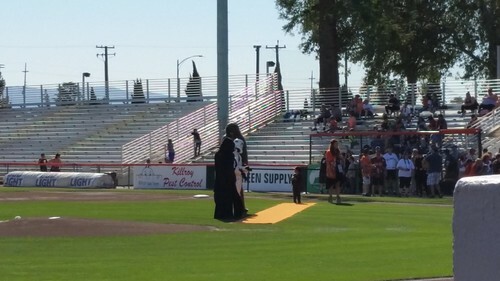 Alas, while the Force may have been with us, it wasn't with the Giants, who fell to the Modesto Nuts, 14-4. Still, we had a great time, and I hope to make another visit with the club maybe next season. 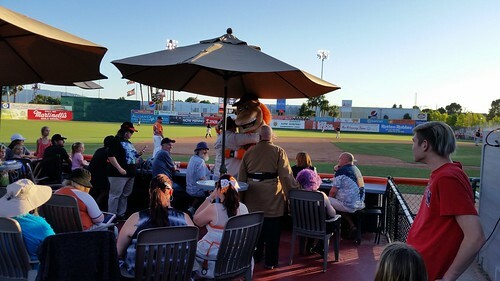 We had lots of room to spread out and relax in the VIP box, and the cost was less than it would have been for upper deck seats and food at Emperor Norton Field at AT&T Park in San Francisco. 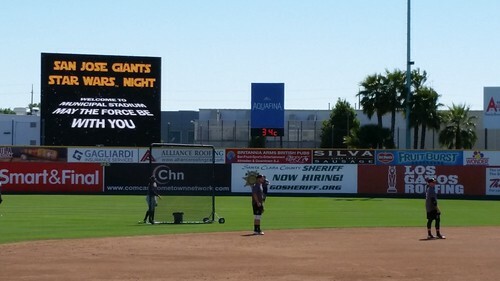 Not that I'll turn down a reasonable chance to go see the Big Giants play, but minor league baseball has considerable attractions. Which reminds me that Lisa and I need to find a chance to go watch the Reno Aces play this season, too.